The Transformers Alternators line has done a great job updating some of the old G1 characters into toys that actually look good. They've managed to give us a few of the more memorable Transformers, but there are just as many that are, shall we say, outside the mainstream? But even the unmemorable ones, like Tracks, still have the edge over the ones no one's ever heard of at all. This little red coupe reached shelves bearing the name Windcharger, which made sense, since the original Windcharger was, indeed, a little red car. But looking at the robot form, there didn't seem to be any connection. 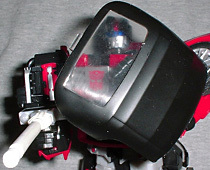 Someone with an encyclopaedic knowledge of Transformers history made the realization: this wasn't Windcharger, it was Overdrive, another little red car from a group known as the Omnibots. With his calm yet sharp wits, he has often turned the tables in an outnumbered battle. Functioning mainly as rescue corps, he will rush over to those who call for aid, leave a stratagem thouroughly thought over for several years ahead and once again move on to his mission location. His range of activity is not just fixed in this solar system, but also reaches other galaxies, serving as the logistics hub for the Cybertron/Earth military force. He is familiar with dimensional travel, and his acute sense of time allows his exceptionally developed senses to sniff out abnormal time flows. 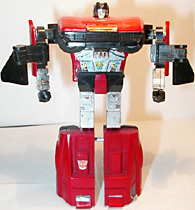 Overdrive was a generic red car that, despite the size difference, seemed to be of the same general design as Windcharger (who was, himself, a Pontiac Trans Am). But the idea behind the Alternators doesn't leave room for generic cars: these are robots in disguise, so Hasbro has licensed real designs from real manufacturers, re-creating specific vehicles in the utmost detail. 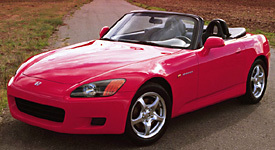 Alternators Overdrive is a Honda S2000, the latest in a series of lightweight, rear wheel drive roadsters named for their engine displacement. In car form, Overdrive is all but indistinguishable from his real-world counterpart. The S2000's blend of smooth contours and sharp lines isn't something you're likely to see on your daily commute, but it is distinctive and it is captured here. From the large air intake at the front to the brake light on the trunk, this is a great representation of the car in question. Even the interior of the car is detailed. The dashboard has the look of the real vehicle, right down to the vents and the passenger-side airbag. To the left of the moveable steering wheel you can see the S2000's unique push-button ignition. Between the two seats you find a gearshift and parking brake, as well as the small storage compartment. The hood, trunk and both doors open, and you can choose whether you want the convertible top up or down - you know, in case it starts raining on your shelf. 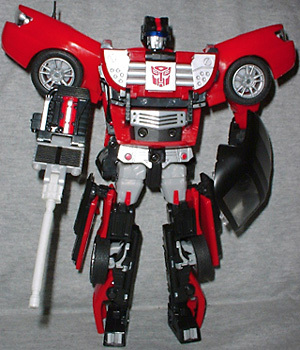 The figure's transformation is unrelated to either Windcharger or Overdrive - in fact, it seems like a more refined version of what we got for Sideswipe, in much the same way that Jazz borrowed a lot from Smokescreen. The head is definitely Overdrive, though. One of the best changes is that the car's hood, rather than hanging down behind his legs, rotates up behind his back. Despite the fact the car is so small, in robot form he's just as tall as any of the other Alternators. The point of giving the Alternators a complex transformation, rather than just having them fold apart like the originals, is that we can finally get some articulation. Overdrive moves at the ankles, hips, waist, shoulders, biceps, elbows, wrists, fingers and neck - plenty of poseability. The car's engine becomes a gun - or at least, it was supposed to. Overdrive actually had one of the more impressive weapons in the series; while everyone else got small little blasters, he was supposed to have a big, honkin' rifle. The car's engine was the body of the gun, while the drive shaft was to become the barrel. 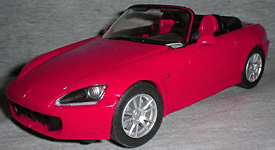 However, when the figure was released, there was no drive shaft to be seen. What happened? Apparently Honda, like so many before them, didn't want to be associated with violence and so the gun became a "shield" - a goofy little shield that looked like half a gun. Yeah. The Japanese version actually made it out with the gun barrel intact, so you can find people on eBay who are willing to help complete your Overdrive. Calling the remnants of the gun a shield is doubly stupid, since Overdrive already has a shield - the car's removable roof plugs into his forearm and becomes a really nice SWAT-style barrier. The "lowered" roof piece can stay in place when Overdrive is transformed, so you won't have any stray pieces laying around. Whatever you want to call this guy - Windcharger, Overdrive, Winddrive, Overcharger, Captain Vroombutt, whatever - the toy is cool. If Hasbro thought people would buy Jazz when he was named Meister, then why wouldn't they buy Overdrive unless he was named Windcharger? What's more important: recognizable names or cool toys? Tell us on our message board, the Loafing Lounge.